As VBS approaches, we’re all looking for new ways to get the word out. Did you know you can change your Facebook profile picture in support of Game On! VBS? Adding a Game On! 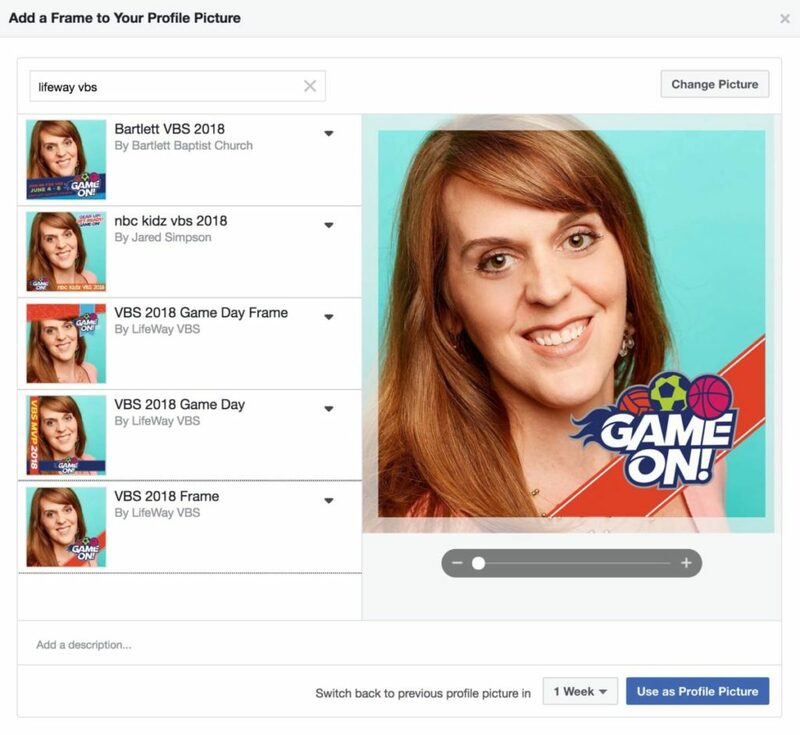 frame to your profile picture is a great way to build excitement in advance of your VBS. It’s also a great way to spread the word about why you love VBS to those in your social media circles. Create your own, or use one of the three LifeWay has already created for you. (1) Go to your Facebook page (not your news feed, but your actual profile page). (4) Type “LifeWay VBS” in the search bar and look for the frames created by LifeWay VBS. You’ll see the change in the preview pane to the right. Adjust the size and position of your picture to whatever works best with the frame you’ve chosen. (5) Select a time frame from the drop down menu just below the preview picture to set how long the Game On! frame will be displayed on your profile picture. Then click “Use as Profile Picture.” That’s it! Easy as can be! What are you waiting for? Let’s make VBS go viral! Will there be any impossible clues this year? That was fun the last time you did it. No clues, but you can join us live on Facebook on June 7th at 2pm CDT for the big reveal! To get the right answer, you have to start at 0 each time. So on the first one you start at 0 then go 4 to the right. Then you go back to 0 and then 3 to the right. So you get Psalm 38:15.